You will love this kiosk a waffle lot with its selection of yum, soft waffles with toppings that range from sugary to sinful. Oh, and did we tell you that Waffle Walle also serves ridiculously yum waffle sandwiches too? Well, you’ll definitely waffle at this nondescript, hole-in-the-wall kiosk tucked away at Meenakshi Mall on Bannerghatta Road. 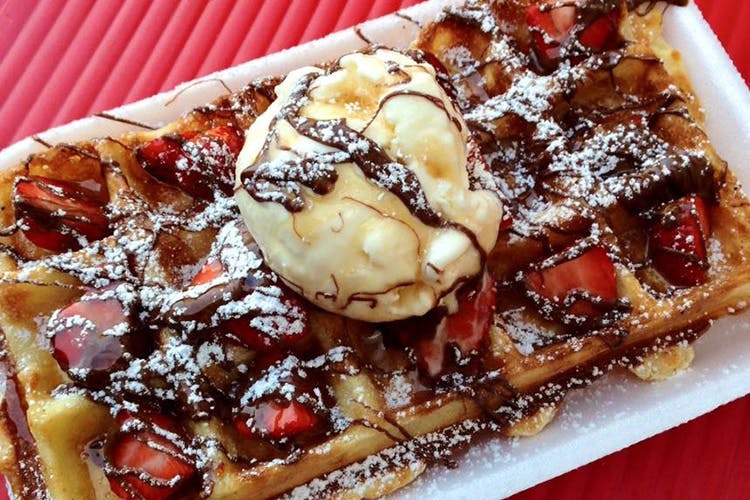 You start with either Liege or Belgium waffles as the base, before moving on the kind of sauce you want — maple syrup, strawberry, blueberry, and the likes — and then finally choosing the choppings that range from whipped cream to fresh fruits and Oreos to sprinkles. If you like soft and buttery waffles, the Brussels waffles are what you need to go for. Crunchier and thicker waffle lovers can go for the Liege ones. Oh, and lest we forget, let’s talk about the Waffle Sandwiches, a sugar inducing goodness. Two crispy waffles sandwich a filling of peanut butter, Nutella, maple syrup, and fresh whipped cream. And make matters sweeter, the entire thing is drizzled with a copious amount of Nutella sauce. Food coma guaranteed with this one. The place is super crowded during evenings from the mall crowd and by the time you get your waffles, you’d have already made a round trip to Belgium. Having said that, it’s still worth waiting for.